You may have seen a couple of reports today about Samsung possibly integrating a camera into the S Pen. Some believe that this is another solution from the company for completely notch and hole-free smartphones. These reports are based on a patent recently granted by the USPTO after Samsung filed for it in February 2017. There are quite a few reasons as to why an S Pen with a camera is probably not happening. Rather, it appears to be one of the many ideas that Samsung just patents and forgets about. After all, it’s better to have a patent on something that may or may not see the light of day. Patently Mobile brought this patent to the blogosphere’s attention after the U.S. Patent and Trademark Office granted it. 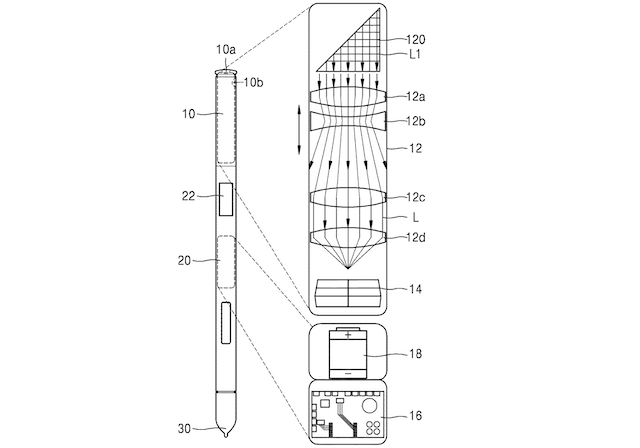 The patent envisages an S Pen stylus which has a camera that provides superior optical zoom functionality. Since most devices rely on digital zoom due to space constraints, this idea might seem like a breakthrough. Since it sounded too good to be true, we dug around a bit and found that Samsung originally filed this patent in Korea on February 29, 2016 (leap year). So it has been three years since this invention was dreamt up and nothing has come of it, as is the case with most patents. The illustrations in the patent suggested that a camera sensor would be fit in the upper chamber of the S Pen with the optical zoom being controlled by a separate button. The sensor would be hooked up to at least one or more lenses. Patents never say if a particular invention is meant for a specific device. However, since the S Pen only comes with the Galaxy Note handsets, it was assumed by many that this feature could come in a future Galaxy Note flagship. Consider this, though, it has been three years since Samsung originally filed this patent. There have been a grand total of zero S Pen with an integrated camera. This isn’t the first patent from Samsung that envisions a greater role for the S Pen. A patent filed in 2014 detailed how a microphone and speaker could be integrated into the S Pen. No progress has been made on that front in five years. Samsung’s head of technology strategy Chai Won-cheol did say in 2017 that the company is conducting studies to see if a microphone can be integrated into the stylus. That being said, there’s no guarantee that it will happen. Another such patent detailed how a Galaxy Note handset’s stylus can double as a breathalyzer courtesy of its built-in gas sensor. The idea being that this will enable adult users to quickly check if they’re over the legal limit for alcohol. This patent was filed in June 2016 and three years on, blowing into Galaxy Note 9’s S Pen will just make people think you partied a little too hard last night. The fickle nature of patents aside, a camera in the S Pen presents some technical challenges as well. Can you imagine how difficult it will be to keep your hand steady as you try to take pictures with a stylus? Even if Samsung fits it with Optical Image Stabilization it’s not going to be a walk in the park. On to the question of enabling greater optical zoom without adding a bulky camera module to the phone. We have already mentioned in some detail how Samsung’s reported acquisition of Corephotonics can vitalize its mobile cameras. Corephotonics has designed 5x and 10x zoom cameras for Oppo and its technology would be very useful for Samsung. Therefore, it’s always better to think objectively about what patents present us with. As we have mentioned time and again, not everything that gets patented ever sees the light of day. There’s not much evidence to support the theory of an S Pen with a camera at this point in time. Maybe technology can advance enough in the next decade to make this a possibility. It’s difficult to see this happening in the next few years. Do you want to differentiate Note 10 from Note 9? That’s easy. Keep the thin top and bottom bezels, fill them in with front facing firing speakers similar to the Razor phone, the upcoming indisplay fingerprint reader plus the obvious double front facing cameras and triple rear cameras. That should be more than enough upgrade to set them apart. No need for infinity V, O, Z, K, Q, etc and especially awful pill shape cutout on the screen. That is an excellent idea. I would like to believe that Samsung would do this for the upcoming Note 10. I have a feeling that Samsung will probably go with that horrible holepunch in the display with the Note 10. I’m in agreement with that. Until they can hide the hole, keep the bezel. The hole will totally mess up our inhouse engineering schematic apps for our dental equipment and we can’t even buy the new Notes if they have a hole in the screen. We bought eight Note9 devices but we won’t be getting Note10 if the hole is there. I have the S9 plus myself as I don’t work in that area but I need to be able to see the files in full screen. I’m concerned as to what the Note10 will be if the S10+ is as Note like as it appears! People have been saying for a while that Notes have been jus an S with an S Pen but they’ve always had their own industrial like design. Which the S10 has taken. Yes, it will be interesting to see what Samsung does to set the Note 10 apart. No. Wait for the Note 12.